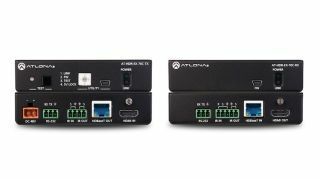 The What: Atlona has expanded its line of 4K/UHD AV devices for high dynamic range (HDR) formats with the introduction of the AT-HDR-EX-70C-KIT transmitter/receiver kit. Extending HDMI, power, and control signals over HDBaseT, the new solution is available immediately and will make its exhibition debut during the company’s 15th anniversary celebrations in stand 5-U80 at ISE 2018 this week through Friday (Amsterdam RAI). The What Else: Like its sibling AT-HDR-EX-70-2PS, the HDR-EX-70C-KIT supports HDMI data rates up to 18Gbps and combines visually lossless compression with the convenience of HDBaseT to deliver images over distances exceeding the limits of HDMI cabling. The HDR-EX-70C-KIT builds on this foundation with bidirectional extension of RS-232 and infrared (IR) control signals, simplifying installation and reducing cumbersome wiring by eliminating the need for multiple cable runs between the AV source, control system, and display. The new extender kit also features Power over Ethernet (PoE), with power for the receiver supplied by the transmitter via the HDBaseT connection. This streamlines integration, while allowing discreet receiver installation at a display or projector without the need for local AC power. At the transmitter end, the included power supply provides ample power for up to three Atlona HDBaseT extenders, reducing clutter caused by multiple power supplies in equipment racks. The HDR-EX-70C-KIT transports HDMI signals up to 4K/UHD at 60Hz with 4:4:4 chroma sampling over Cat-6a or Cat-7 cable, transmitting 1080p video up to 230 feet (70 meters) and HDR-enhanced 4K content up to 130 feet (40 meters). Providing flexible compatibility with new and emerging 4K/UHD video sources and displays, the new extender is HDCP 2.2 compliant and supports all video resolutions, audio formats—including PCM, Dolby, and DTS—and color space standards encompassed in the HDMI 2.0b specification. Able to pass metadata for HDR content, the solution supports the 4K HDR10 format at 60Hz (4:2:0 chroma subsampling, 10-bit color) and Dolby Vision at 30Hz. Integrated HDBaseT link integrity testing provides additional value for systems integrators and end users, helping them verify or troubleshoot connectivity attributes such as RJ45 termination and twisted-pair cable quality. A test button and LED on the transmitter unit enable quick visual confirmation of the integrity of the HDBaseT link between the transmitter and receiver, while a free software utility provides real-time link status plus detailed diagnostic and signal information.